In the Connecting 2 Arduinos by Bluetooth using a HC-05 and a HC-06: Pair, Bind, and Link post I explained how to connect a HC-05 to a HC-06 so that when powered they automatically made a connection. Here we look at using that connection to get Arduinos talking over Bluetooth. Before continuing you need to have the Arduinos and BT modules set up as per the previous post. Here I am using 2 HC-05s. One in master mode the other in slave mode. 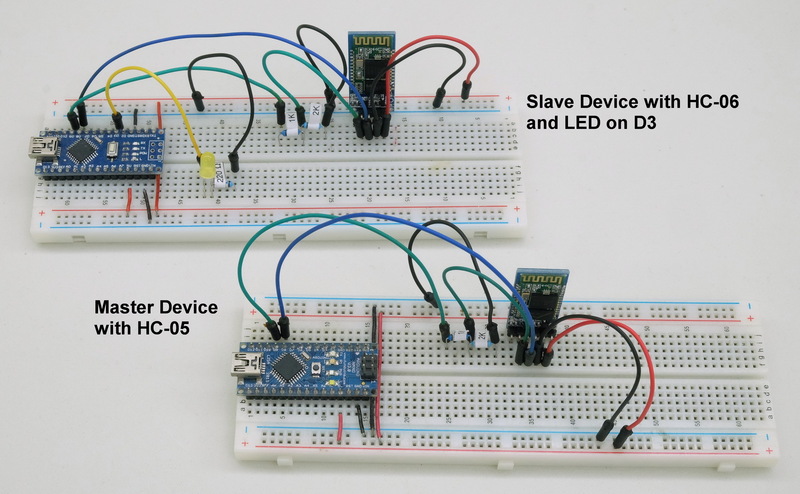 The setup process for the slave mode HC-05 is the same as the HC-06 in the previous post. 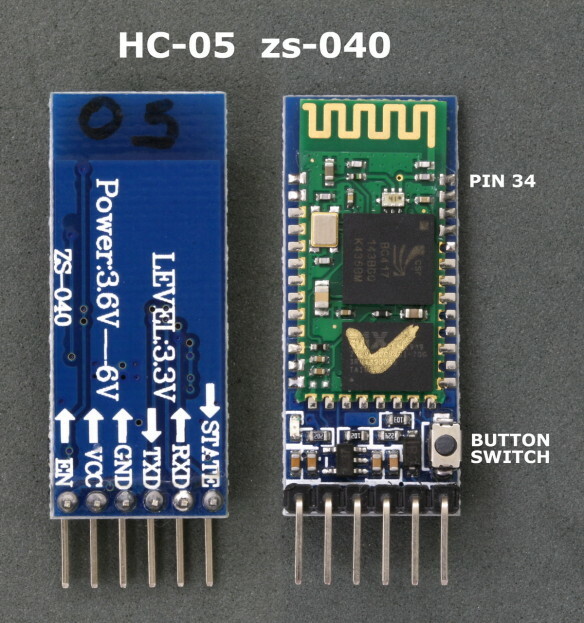 The STATE pin on the HC-05 zs050 board is connected to the LED 2 pin on the small bluetooth module and the LED 2 pin is used to indicate when there is an active connection. This means the Arduino can connect to the STATE pin and determine when we have a connection. The STATE pin is LOW when the HC-05 is not connected and HIGH when the HC-05 is connected. As a quick visual indicator you can put a LED + suitable resistor on the STATE pin. When the module is connected the LED will light. You can also use the Arduino to read the value of the STATE pin. In a previous post I showed how the HC-05 can auto connect to other Bluetooth devices by setting the HC-05 to pair with any device using CMODE=1. This is quick and easy but does not give any control over which other device the HC-05 connects to. In this post I show how to set up the HC-05 to always connect to the same HC-06 (or HC-05 in Slave mode). For this we use PAIR, BIND, and LINK. NOTE: There are now newer modules that use a 3.0-20170601 firmware. This guide does not work for these modules (AT+INQ gives an error). I do not have any of the new modules and cannot find a reliable supplier. I have ordered 3 sets of BT modules believing they were the newer ones only to receive old ones. If you have not yet bought BT Classic modules. I recommend buying the original HC ones. These are slightly (just a little bit) more expensive but are well supported and full documentation is available. Original HC modules have the HC logo screen printed on the main BT board and the current boards have a blue LED top left. 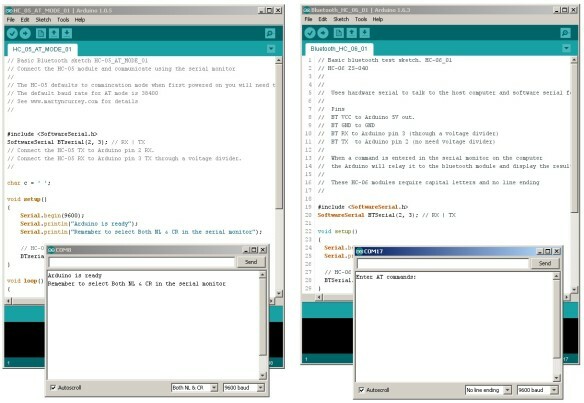 I am using 2 separate Arduino IDEs; version 1.6.3 which is installed, and version 1.0.5 which I run from a folder (it is the non install version). This allows me to use 2 IDEs at the same time, each connected to a different Arduino. It also gives me 2 serial monitors, one for each Arduino. 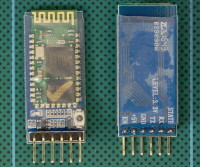 The modules used are the zs-040 versions of the HC-05 and the HC-06. The HC-05 has the Wavesen/HC firmware 2.0-20100601 and any any module running the same firmware will be the same. The HC-05 has 2 AT command modes which I refer to as “mini” AT mode and “full” AT mode and some commands only work when in “full” AT mode. To enter “full” AT mode pin 34 needs to be HIGH and kept HIGH. To accomplish this I have made a connection from pin 34 to +3.3v. See the diagram below (or after the jump). Using the CMODE command we have an easy way to connect the HC-05 and the HC-06 (or 2 HC05s). When the HC-O5 is configured to pair with any address (AT+CMODE=1) it should connect to a Slave module automatically. No binding etc is required. I am using the zs-040 modules with firmware 2.0-20100601 and other modules with the same firmware will be the same. If you have issues check the data sheet for your module. 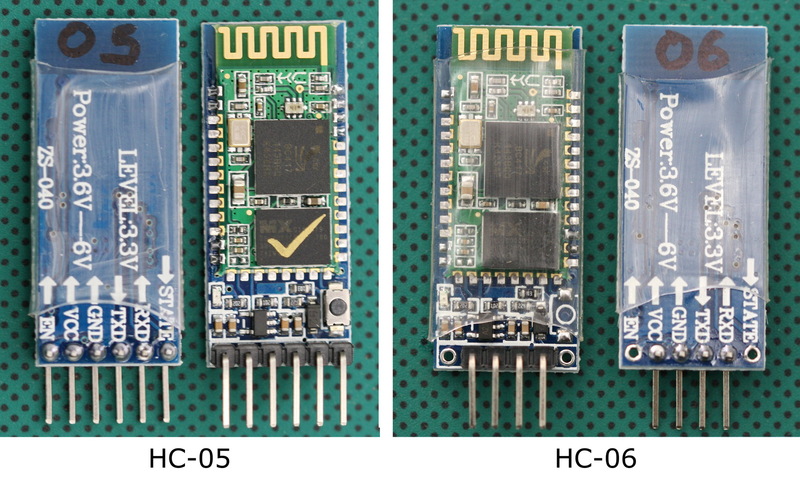 There are now newer HC-06s and HC-05s that use the zs-040 breakout boards. These new modules have a LED (usually blue) at the top left of the Bluetooth daughter board and have a different firmware to the below. See HC-06 hc01.comV2.0 for an introduction to the HC-06. I haven’t written up details on the HC-05 yet. Here is the zs-040 version of the popular HC-05. The HC-05 is based on the EGBT-045MS Bluetooth module. It can operate as either a slave device or a master device. As a slave it can only accept connections. As a master it can initiate a connection. 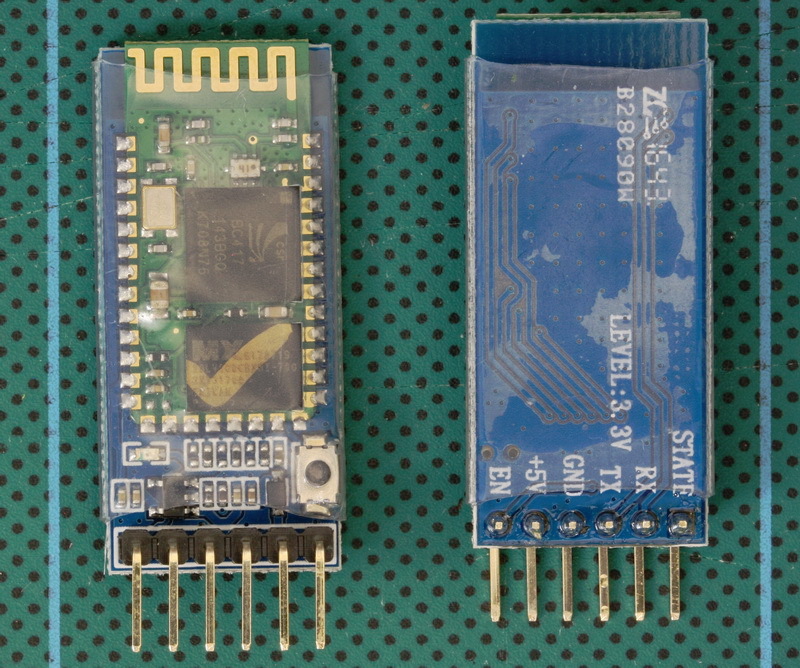 The EGBT-045MS Bluetooth modules (the smaller daughter board) is a 3.3v device. The HC-05 break out board has a 3.3v regulator that allows an input voltage of 3.6v to 6v but the TX and RX pins are still 3.3v. This means you can use the 5V out from the Arduino to power the boards but you cannot connect the Arduino directly to the HC-05 RX pin. For the HC-05 RX pin (data in) we need to convert the Arduinos 5V to 3.3v. A simple way to do this is by using a voltage divider made from a couple of resistors. In my case I use a 1K ohm resistor and a 2K ohm resistor. Since the Arduino will accept 3.3 volts as HIGH you can connect the HC-05 TX pin (data out) directly to the Arduino RX pin (The 5V Arduino takes a voltage of 3V or more as HIGH). Update: If you have modules that have a blue LED in the top left hand corner then you have a newer model with a slightly different firmware although they should operate the same. I recently bought some HC05s and HC-06 Bluetooth modules. These are pretty standard, especially when using with the Arduino and I was surprised at how easy it was to get basic serial communication working. There are several slightly different modules available. The ones I have are marked zs-040. The zs-040 boards differ from some of the other modules in that they have a EN pin rather than a KEY pin.